The national Sigma Alpha Epsilon (SAE) fraternity announced March 6 that the new member program and identification of the term “pledge” or “new member” would be eliminated from their procedures. The change came into effect March 9 and requires all 226 chapters and 15 colonies across the nation to apply the historic change. If any chapters choose not to comply, the national fraternity will mandate the closing of those chapters. The Supreme Council unanimously supported the change. “This change will strengthen our fraternity, create highly-positive opportunities to redefine membership, attract prospective members who otherwise might not join and lead the way among Greek-letter organizations as we recommit ourselves to our founding fathers’ original concepts and return to their intent for membership in the fraternity,” the national SAE headquarters website said. 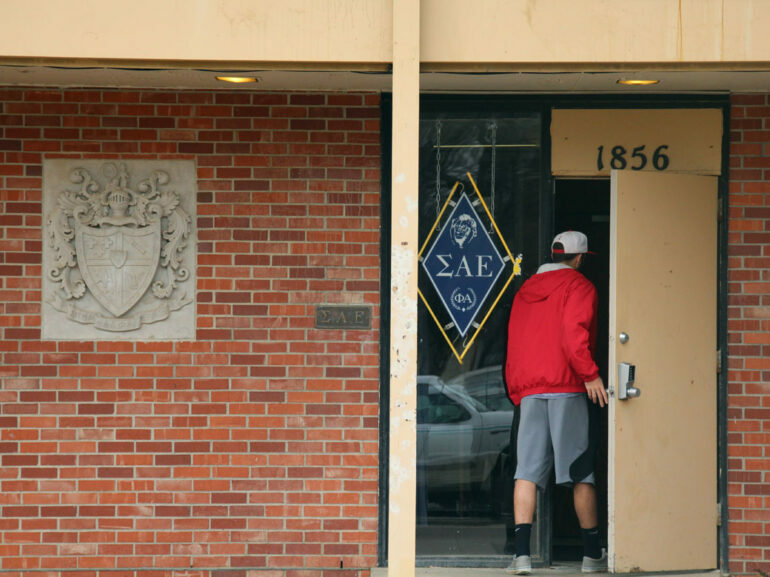 According to the official SAE website, the change was made to protect the future of the fraternity and remove the class structure between those who have just joined — new members — and those who have been initiated — active members. “This change will adopt a method, practice and policy that treat all members equally and fairly and strive for a continuous development of our members throughout their lives,” it said. A new program titled the “True Gentleman Experience” was created as a source for guidelines on the new change. The program had all members, along with alumni, in mind as it would “enhance the educational and leadership experience of our members and build upon their development during each year of their collegiate tenure,” the SAE website said. Instead of using the terms “new-member” or “pledge,” a complete educational period will occur. Members will learn about SAE’s values, its mission, creed and history. The intention is designed to help students develop throughout their college career so when they graduate they will possess the skills necessary for life. Prospective members will be recruited as they always have been, but when a student is extended a bid to join and accepts, he will become a collegiate member. It would be necessary for the student to accept SAE’s Scope of Association Agreement and complete the Carson Starkey Membership Certification Program. Membership requirements and expectations must be met; otherwise, SAE Fraternity Laws could suspend or remove the membership. Factors like membership experience and leadership evaluations were taken into consideration. The announcement of the change was spread in the midst of SAE being called the “deadliest U.S. fraternity,” by Bloomberg, a source for business, financial and economic news, and stock quotes. An investigation by Bloomberg in December found the fraternity had at least nine deaths since 2006 associated with hazing, alcohol or drugs at their events. This number is more than any other fraternity. Since 2005, more than 60 deaths connected to fraternities across the nation have occurred, with SAE holding the highest number of deaths. Brandon Weghorst, associate executive director of communications for the national organization, said hazing is “not what SAE is about,” and was not the only factor considered in making the decision. “We know all the good things that happen every day that get overshadowed,” Weghorst said. He said hazing does not occur merely with fraternities as people associate it, but it is an issue that affects other organizations, citing the military as one of them. He said the leadership understands it would take time to be fully implemented and understood, but in the end would protect what they have and enhance the students’ education. Weghorst said it is hard to say if this would lead to other changes among Greek organizations, but it has started a conversation as several of them have reached out to see how it worked. The historical change was broadcast widely and regional fraternity leaders followed up with their chapters, Weghorst said. Amber Groh, director of sorority and fraternity life and leadership at the University of South Dakota declined to comment. USD Sigma Alpha Epsilon president Marcus Mahlen also declined to comment on the change at time of print. Photo: A member of Sigma Alpha Epsilon enters the fraternity house March 24. The national SAE organization announced all chapters across the country will be required to initiate pledges 96 hours after extending a bid to new members.